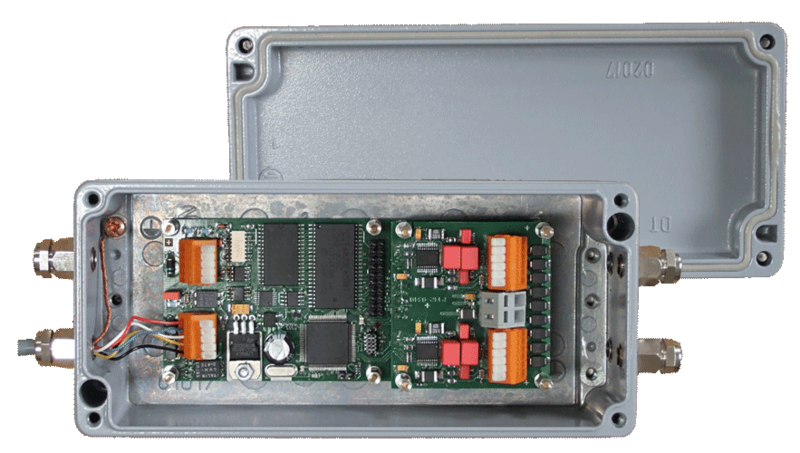 Our standard product integrates 1 to 4 separate Delta-Sigma-ADCs with a microcontroller, flash memory and a real-time kernel to allow all kinds of processing at the measuring point. 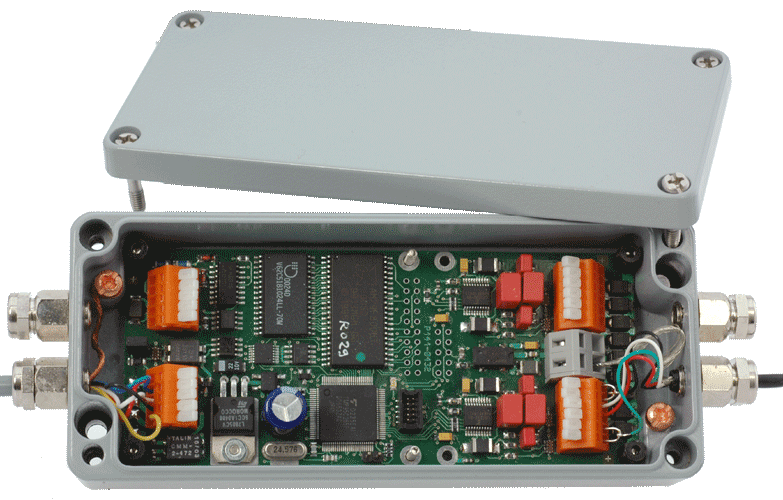 The "Loadcell" signal conditioning box provides hardware with firmware for most standard weighing applications. It comes in a small version with 1 or 2 channels and a slightly bigger one with 3 or 4 channels. LOADCELL assembly with one Δ-Σ-ADC, microcontroller post-processing and communications. LOADCELL assembly with four Δ-Σ-ADCs, microcontroller post-processing and communications. Load Cell is a transducer for load cells with strain gages that can combine up to 4 load cells to one scale, depending on the constructural conditions. There are variations for one, two and four load cells available. LoadCell feeds the load cells over an internal voltage regulator with 5V and it consists of an own, high-resolution Delta-Sigma-ADC with low-noise measuring amplifier for every load cell. 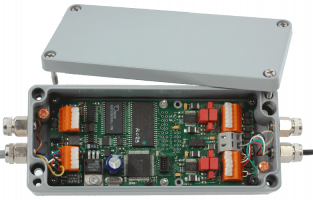 A processor with realtime operating system parametrizes and coordinates the ADCs and runs the communication with the superior controller over the bus-compatible serial RS232 interface. Optionally for the connection to other devices there are hardware-extensions for the operations with CAN (option CAN) or I²C (option I2C) available. 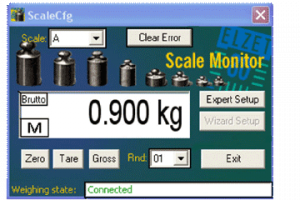 For the handling with a PC (with the help of the converter board 232FEED485) ELZET80 adds a software "ScaleConfig" wherewith LoadCell's parameterisation can be performed conveniently. The software is divided into three parts: The main window "Scale-Monitor" with selection box for the scale that is connecteed to the RS485-Bus, a large display of the weight which is actually scaled and buttons for zero setting, buoyancy and raw value display. A status line displays the state of communication and the errors. If it is not intended to integrate Load Cell in an own operating software the main window can also be used as handling window (bedienfenster?) for the daily use. The parameterisation can be started through the main window by the buttons "Expert Setup" and "Wizard Setup" respectively, optionally by completing parameter scales (Expert) and led point-to-point in the wizard setup. We suggest the wizard setup for the initial operation. The main window consists one large display for the weight's acounts, a taskbar, two selection boxes and several buttons with different functions. In the display panel appears beside the scale of the weight also a "M" which represents "move" and displays if the scale stands in holdup or not. Furthermore it displays in which modus the scale is working and if the auto-zero is activated. Gross represents the weighing without and net for with previous buoyancy . Above this is an selection box which enables to change the address (A-Z) of the sent messages and therewith to appeal to other scales with the respective addresses. Beside this box is a button with the inscription "Clear Error", wherewith you can delete errors that are displayed by the scale as for example: ERR 90 usw. Below the display panel you can find three more buttons. The first one "Zero" sets the scale to zero, the second one "Tare" tares the weight which is on the scale and the last one "Gross" deletes the buoyancy. The second selection box "Rnd" is located on the right side of these ones and enables the rounding of the weight scale per software. The status line which displays all errors which occur in relation with the weight's request and the three buttons on the right side of which the lower one closes the window and therewith also the programm are worthy of mention, too. The other two buttons give the user the possibility to choose the kind of alignment and calibration he desires. In the expert modus all alignments have to be done manual so that eventually "absurd" inputs are possible. This is different in the wizard modus where a part of the alignments is done by the programm, there are supports and options refearing to the resolution of the displays weight values are provided. The expert modus' window features three menu entries. The first one "Reset" comes across as a button and sends the command for reset to the scale immediately. "Calibration" opens one more window where the calibration of the scale can be done in. Under "Communication" you will find two more entries: "Pc" and "Scale" and they open in turn smaller windows where you can change the features of the serial interface for the respective selection. Furthermore you find a "close" button in the nether left side and three more buttons below the menu bar wherewith you can charge and send parameters, and store them in EPROM. All parameters - except the internal resolution and the setup parameters for the scale's serial interface which are located in a different window - are charged while opening the window. This one offers - as the main window does as well- a status line at the lower border which displays errors that occur eventually at once. Moreover the inscription of the parameters where the errors occured are colored red.